I drove three young men who were in their mid twenties from a party in South Salem to the Eola Inn in West Salem, at 3:00 AM, Sunday morning. The trip there took over half an hour, including a stop at the main talker’s house, who was sitting up front, in the 263 Van with me. Since I just finished watching the award winning film about an explosives disposal unit in the Iraq war, called “The Hurt Locker” before I started my shift, I mentioned it to my passengers. They just saw it too, and the guy up front with me told me that one of his friends had his leg blown off in Iraq, when an IED blew up the Humvee he was in. He told me that his friend found a video of the actual explosion posted on the Al Qaeda website. 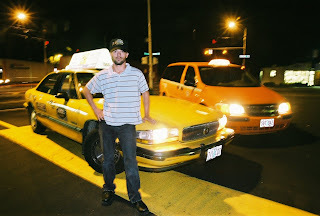 We had a cab driver that was a marine who just got back from Iraq a couple of years ago. His name was Nick Spliethof, and he was driver number 35. Nick was a truck driver in the marines and he was driving an ambulance when it hit an IED that killed the marine in the passenger seat and left Nick with enough shrapnel to get him a monthly disability payment every month after his discharge. Then one day when I was sitting in front of the Greyhound bus station a good sized well build man, who looked to be in his late thirties with a mustache asked me if I was available. Sure, I told him, as he threw his large leather suitcase in the back seat, and sat up front with me. “Yes,” I told him, as I started driving. On the way there, I found out that he was a military contractor, who spent fifteen months in Iraq and Afghanistan helping the country put together Boy Scout troops, with thousands of young boys. He was helping to build the future of both countries, from the ground up. He said that he had interrogated hundred of insurgents, and they were all from outside countries. In one case he interrogated a man who was from Kazakhstan, and had come to Iraq for military training with Al Qaeda. He was driving a truck across town in Bagdad, when he stopped to get a soda pop from a vendor, when his truck exploded. He surrendered himself to the American military, because he said that he didn’t know that he was supposed to be a suicide bomber. Another night I picked up a guy at the South Liberty Bar & Grill who kept calling me sir, until I finally asked him if he was in the military. He told me that he was home on leave for a month until he returned to Iraq to finish his year there. “What is it like there?” I asked him. Driver number 26 was in Operation Desert Storm, and was glad when the US invaded Iraq and finally finished the job that they started in 1991. I’ve watched some of my passengers ship out to, and return from Iraq and Afghanistan, over the past six years multiple times, until I remember them by name and they ask for me to drive them. “The Hurt Locker” begins with a quote by Chris Hedges , an American journalist who specializes in war correspondence and Middle Eastern and American cultures - “The rush of battle is often a potent and lethal addiction, for war is a drug” - from his 2002 publication of “War Is A Force That Gives Us Meaning”. All of this set my mind in motion to begin to consider the correlation between war and the Bible. The Old Testament is filled with enough epic battles and gore to fill the script of any present day Hollywood bloodfest producer. So with the Bible as the foundational volume of Western Civilization, it stands to reason that the culture itself is schizophrenic, as is the Bible. After the continual violence of the OT, even through the apocryphal inter-testamental period, the New Testament does an about face, after Judaism is impacted by a variety of religions from Seraphism and Zoroastrianism to Buddhism and Mithraism. Now we are confronted by a new live and let live, non violent philosophy, as espoused by the dominant figure of the New Testament, Jesus “the Christ” of Nazareth. Through the teachings of Jesus and his biggest post resurrection fan, the apostle Paul, we find out that there is equality for all. It doesn’t matter if you are a slave, or even worse, a woman, you are no different in God’s eyes than a free man, and that’s all that matters.